THE PASEO, A FESTIVAL BRINGING THE ARTS OF INSTALLATION, PERFORMANCE, AND PROJECTION TO THE STREETS OF TAOS, IS COMING UP ON SEPTEMBER 23 & 24, FOR ITS THIRD YEAR OF CELEBRATING ‘UNHANGABLE ART.’ LIVETAOS AND KNCE ARE PARTNERING WITH THE PASEO TO BRING YOU GREAT INTERACTIVE COVERAGE BEFORE, DURING, AND AFTER THE EVENT! THIS SERIES PROFILES SOME OF THE MANY FABULOUS ARTISTS BRINGING THE PASEO TO LIFE FOR A THIRD YEAR. 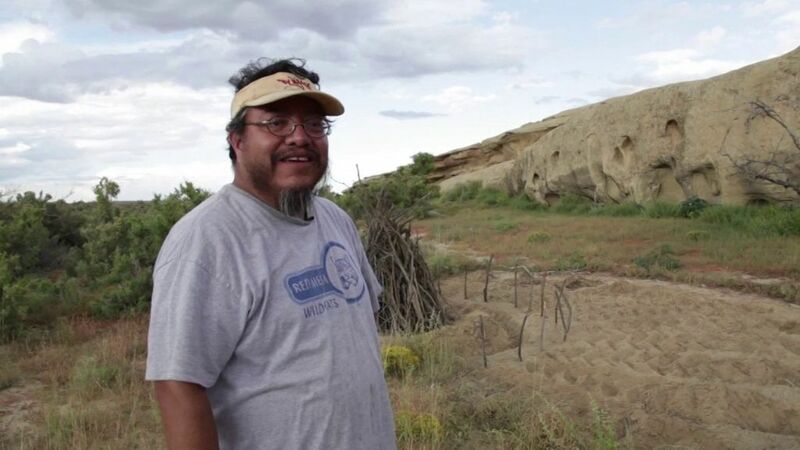 Bio (from The Paseo’s website): Mr. Benally is a Diné artist from the Navajo Nation now living in New York City, where he is a doctoral student at Columbia University. Benally recently collaborated with Chinese dissident artist, Ai Weiwei, on an artwork titled Pull of the Moon. 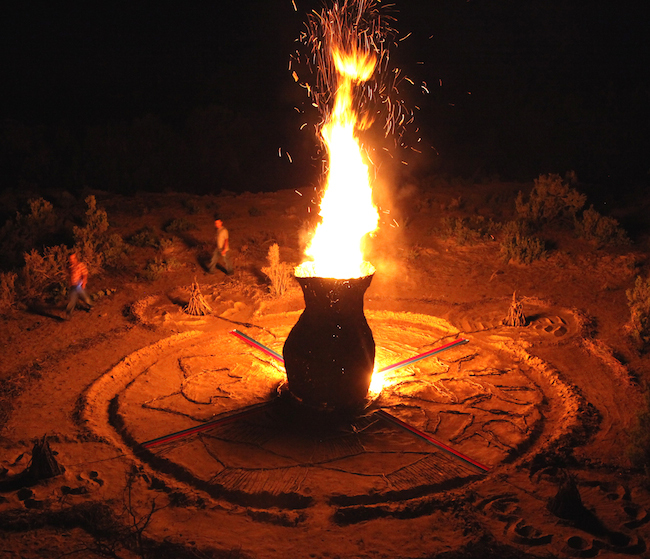 It is a collaboration for Navajo TIME (Temporary Installations Made for the Environment) and is located deep in the desert of the Southwest, amidst the dramatic scenery of Coyote Canyon. “Harmony” is at the foundation of the Diné philosophy of life and plays a central role in all of Mr Benally’s work. LiveTaos: What is Sand Rays? Bert Benally: Sand Rays is basically an idea using LED lights to give sand a glow. The LED lights will be buried under the sand and the LED lights will be programmed to show different patterns that will hopefully give the impression of rays. How do you use LED light to emanate patterns from sand paintings? The LED lights will be laid out in a linear pattern and connected to an arduino, which has been pre-programmed with a light sequence. The light will emanate from underneath the sand. There will be sand-painted images on the sand as well and they will play off each other to enhance the visual experience. How do the light patterns respond to the presence of viewers? The plan is to connect a sensor to the arduino, which will trigger the LED lights to turn on. The original plan was to have the range sensor trigger various LED lights sequences as the viewer gets closer to the piece, but up till now the coding has been quite challenging, so I am not sure if we can pull that. But it will definitely be triggered when it senses people, and turn on the LED lights. What inspired you to interface sand paintings with LED light? I am a Navajo and sand-paintings are a traditional art form of the Navajo people, and it is something that I am very familiar with. I previously made a sand paintings using neon tubes bent into various shapes, and the color from the neon glowed under the sand. I also played with light and shadow by manipulating sand around a lightsource. The use of LED lights seemed to be a logical step forward. You’re currently working on your doctorate at Columbia University — did you come there from the Navajo Nation? I was an elementary school art teacher and while I was there I included various Native American and Navajo specific themes and projects. While teaching I notice that there was not much information as far as what the exact foundations of Navajo aesthetics and basic elements and principles were. The Native American art lessons were basically taught using the western perspective. An opportunity presented itself to move forward with my education, and so I applied to Teachers College at Columbia University and I got accepted in the fall of 2015. I am very excited to research the questions I had as an art teacher. What aspects of Diné art and culture are you working with in Sand Rays? I am using sand paintings and the concept of harmony as the foundation, as I incorporate various aspects of modern elements to move the traditional arts forward into the future. What connection do you see between urban New York City life and traditional life of Diné culture? I think the connection I see is the need to maintain the concept of harmony in the lives of both areas. I believe that there is a disconnect between the people, ideas, spirituality, the environment and other important values and principles that make us function as cohesive humans in a world inhabited by others who are not human beings. I think art can be a visual reminder that we do not live in this world alone, and we need to respect where we are and our surroundings. Can you tell me about Harmony in Diné philosophy and how it relates to your work? Harmony is a way for me to bring closure to controversial topics I sometimes tackle. The common way artists often deal with controversy is just to bring it out into the open without offering a solution. The heated debates, anger, arguments, that ensue are viewed as signs that the piece has merit, but in reality a lot of those topics have still not been resolved. As a Navajo, the concept of harmony encourages me to bring a topic full circle and offer some sort of closure or resolution. In this way people who view my art can come away in a way that is positive, even if the topic is hard to deal with. Can you talk a bit about your work with Ai Weiwei, Pull of the Moon? My work with Ai Weiwei was very a difficult piece to execute because of the limits on communication as a result of his house arrest at the time. We had a general theme in mind and we went through various ideas but could not work out a solid idea, because time was limited we decided to work on individual projects around the same theme and I think it worked out wonderfully. Are Sand Rays related to that project? Sand rays, I suppose could be viewed as an extension of how materials can be used to express ideas using traditional art foundations as the vehicle. Is there anything else you’d want Paseo viewers and participants to know about your installation? Well… I accepted this invitation because it was an opportunity for me to use technology I previously had not used. An opportunity to learn a new medium, in this case using an arduino and learning how to code to make it do things I want. I probably could have hired someone to make it for me, but it would have lost the reason to try a new medium. I am still learning, but the potential for this new technology opens up a wide range of possibilities and I am grateful to have been given this opportunity learn this new medium. Learn more about The Paseo at www.paseoproject.org, and save the dates: September 23 & 24, 2016. 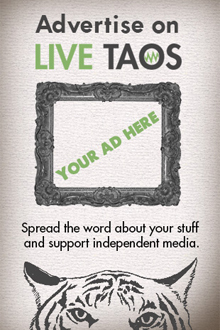 Stay tuned to LiveTaos and KNCE 93.5FM, www.truetaosradio.com, for ongoing interviews and coverage! Want to help make The Paseo happen? Good news — you can! They need volunteers for all sort of jobs; click here to learn more and sign up.